San Cristóbal island presents many facets of the Galápagos Islands’ natural and human history. It is also an adventure capital, with great snorkeling and the best surfing in the Galapagos. Pack a picnic lunch and head out for the day. Many of the visitor sites are easy to get to without a guide. Tour operators can take you out to other destinations around San Cristóbal and to nearby islands. All national park sites are open 6 a.m. – 6 p.m.
Puerto Baquerizo Moreno, San Cristóbal’s main town and the capital of the Galápagos Islands, sits on a broad, horseshoe bay dotted with beaches. Right downtown is Playa de Oro, good for snorkeling and swimming. Going southeast from the center, you come to Playa de los Marinos and El Cañón (surfing, snorkeling, swimming). Heading west from Playa de Oro is Playa Mann (snorkeling and swimming). 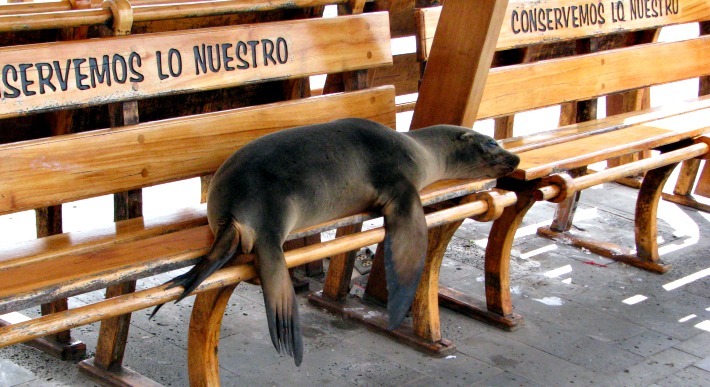 La Lobería, located near the airport, is deservedly famous for its large sea lion population. Many frigate birds, finches and yellow warblers nest in the mangrove and palo santo forest. This beach is also great for snorkeling, swimming and surfing. The Interpretation Center (Centro de Interpretación) offers three galleries describing the Galapagos Islands’ origins, their human history and conservation. As well, it has scale models of ships, a high-relief map of the islands, and self-guiding hiking trails. The Center marks the beginning of the trail to Cerro Tijeretas and Punta Carola Beach. Cerro Tijeretas, located 3.5 kilometers (two miles) from Puerto Baquerizo Moreno, has scenic viewpoints on its three peaks, including a grand vista of León Dormido rock. A statue of Charles Darwin commemorates his visit in 1835. Cerro Tijeretas owes its name to the two species of frigate birds that nest here. Following Avenida Alsacio Northía northward, you come to Punta Carola, one of Isla San Crisóbal’s most famous beaches. This golden strand is home to sea lions and marine iguanas. This prime surfing territory is also perfect for swimming and snorkeling. In the highlands of San Cristóbal are the ruins of Hacienda El Progreso which bespeak one of the most tragic chapters of Galapagos history: the slave conditions of the sugar plantation of Manuel Cobos, who is buried at this site. To get here, you can catch a local chiva (bus) or taxi, or bicycle up. El Junco is set the crater of San Cristóbal Island’s extinct volcano. This is the only freshwater lake in the entire archipelago. Luxurious vegetation provides habitat for a number of bird species. From El Junco, a road heads to San Cristóbal’s southeast coast. Along the way is the Galapaguera Cerro Colorado breeding center, where the local species of giant tortoise are being bred. The road from El Junco ends at Puerto Chino. After your explorations of San Cristóbal’s highlands, relax on this long, white-sand beach and observe the abundant shorebirds. Day trips to the highland visitor sites and to Puerto Grande and Cerro Brujo can be arranged through local tour agencies. Scuba diving can be done at Islote Five Fingers, Isla Lobos, Roca Ballena and Roca Este. León Dormido and Punta Pitt also offer snorkeling. If you would like to spend a few days exploring San Cristóbal, it is easy to do it on your own. You can get to many of the visitor sites without a guide. Tour operators can take you out to guide-required sites or for scuba diving. Arriving at San Cristóbal is easy. Flights depart from Quito and Guayaquil, and local flights and boats connect San Cristóbal with the other inhabited islands. As well, some Galapagos island cruises begin (or end) in Puerto Baquerizo Moreno. As one would expect of a capital city, Puerto Baquerizo Moreno offers all the services a tourist needs for spending a few days in this corner of the Galapagos. Besides a wide range of hotels and restaurants for every budget, the town also has a bank with ATM. Have you been to a place or done an activity on San Cristobal island that you would recommend to fellow travelers? Share your tips in the comments below.